Review by AllTheBestFights.com: 2017-09-16, disappointing fight between Billy Joe Saunders and Willie Monroe Jr: it gets two stars. The undefeated Wbo Mw champion Billy Joe Saunders entered this fight with a perfect boxing record of 24-0-0 (12 knockouts) and he is ranked as the No.7 middleweight in the world (currently the #1 in this division is Saul ‘Canelo’ Alvarez). He fought just twice in the last two years winning over Andy Lee (=Lee vs Saunders) and Artur Akavov (=Saunders vs Akavov). His opponent, Willie Monroe Jr, has an official record of 21-2-0 (6 knockouts) and he entered as the No.10 in the same weight class. He lost to Gennady Golovkin in 2015 (Golovkin vs Monroe) but then he has beat John Thompson and Gabriel Rosado (=Monroe vs Rosado). 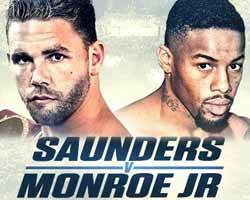 Billy Joe Saunders vs Willie Monroe Jr is valid for the WBO World middleweight title. Watch the video and rate this fight! Review by AllTheBestFights.com: 2016-09-17, disappointing fight between Willie Monroe Jr and Gabriel Rosado: it gets two stars. Willie Monroe Jr entered this fight with a pro boxing record of 20-2-0 (6 knockouts) and he is ranked as the No.13 middleweight in the world. He lost to #1 Mw Gennady Golovkin (Golovkin vs Monroe) but he came back to win in 2016 beating John Thompson. His opponent, Gabriel Rosado, has a record of 23-9-0 (13 knockouts) and he entered as the No.20 in the same weight class. He suffered three consecutive losses between 2013 and 2014, the last one against David Lemieux (=Lemieux vs Rosado), but then he has won over Joshua Clottey (=Clottey vs Rosado) and Antonio Gutierrez. 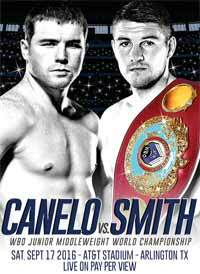 Monroe vs Rosado is valid for the vacant WBO Inter-Continental middleweight title; undercard of Saul Canelo Alvarez vs Liam Smith. Watch the video and rate this fight! Review by AllTheBestFights.com: 2015-05-16, great fight between Gennady Golovkin and Willie Monroe Jr: it gets three stars. The undefeated Gennady Golovkin entered this fight with a perfect boxing record of 32-0-0 (29 KOs=91%) and he is ranked as the No.1 middleweight in the world. In his last three bouts he won over Daniel Geale (=Golovkin vs Geale), Marco Antonio Rubio (=Golovkin vs Rubio) and Martin Murray (=Golovkin vs Murray). His opponent, Willie Monroe Jr, has an official record of 19-1-0 (6 knockouts) and he entered as the No.17 in the same weight class. He suffered his only defeat in 2011 when he faced Darnell Boone (via split decision), since then he has collected nine consecutive victories winning the ESPN’s Boxcino Mw tournament in 2014, against Brandon Adams (=Adams vs Monroe Jr), and beating Brian Vera in his last bout (=Vera vs Monroe Jr). 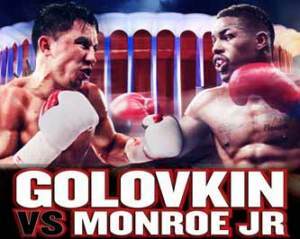 ‘GGG’ Golovkin vs Monroe is valid for the interim WBC, IBO, WBA middleweight titles (all held by Golovkin) but the Wbc belt is not on the line for Monroe since he didn’t comply with Wbc rules prior to the bout (30-day and 7-day pre-weigh-ins and medical examinations). Watch the video and rate this fight! Review: 2014-05-23, fight not particularly good between Brandon Adams and Willie Monroe Jr: it gets two stars. The undefeated Brandon Adams entered this fight with a perfect record of 14-0-0 (9 knockouts) and he is ranked as the No.77 middleweight in the world while Willie Monroe Jr has an official record of 17-1-0 (6 knockouts) and he entered as the No.62 in the same weight class. Adams vs Monroe Jr is the final of the ESPN’s 2014 Boxcino middleweight tournament and is valid for the vacant NABA and WBO NABO middleweight titles; Adams defeated Daniel Edouard in the quarterfinals and Raymond Gatica in the semifinals (=Gatica vs Adams) while Monroe Jr won over Donatas Bondorovas and then-undefeated Vitaliy Kopylenko (=Kopylenko vs Monroe Jr). Watch the video and rate this fight! 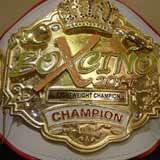 Review: 2014-04-18, fight not particularly exciting between Vitaliy Kopylenko and Willie Monroe Jr: it gets two stars. The undefeated Vitaliy Kopylenko entered this fight with a perfect record of 23-0-0 (13 knockouts) and he is ranked as the No.72 middleweight in the world while Willie Monroe Jr has an official record of 16-1-0 (6 knockouts), he suffered his only defeat in 2011 when he faced Darnell Boone who is the only man that defeated #2 light heavyweight Adonis Stevenson in his professional career (on April 16, 2010 – after three years Stevenson won their second bout: Stevenson vs Boone 2). Kopylenko vs Monroe Jr is the semifinal of Espn’s 2014 Boxcino Mw tournament; in the quarterfinal Kopylenko defeated Cerresso Fort by tko in the second round while Monroe Jr beat Donatas Bondorovas via unanimous decision. Watch the video and rate this fight!